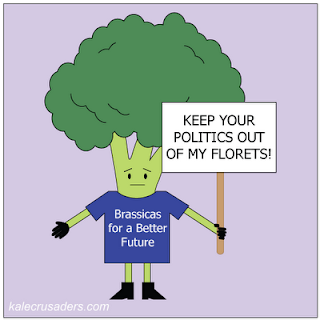 Broccoli has been a polarizing figure in politics for some time now. George Bush Senior reviled him in the 90's. Critics of the current American health care reform legislation paint scenes of force-feeding broccoli to a nation. Love him (roasted with carrots, garlic and herbs) or hate him (in broccoli burgers), Broccoli is here and will not disappear! P.S. As a site devoted to underrepresented foods, our focus on the underrepresented has been slipping. Last week we made a cute Father's Day pun with probably one of the least underrepresented foods. Today's featured food currently suffers from a case of overexposure of the political kind, but we couldn't resist throwing our hat into the ring. Oh my goodness, so cute!!! PS Those broccoli burgers looks yum! We're glad you approve of Broccoli! We're excited to try the broccoli burger recipe soon. We are thinking of replacing the couscous in the recipe with quinoa. Were you mindful that that about every one of the (90%) of the broccoli sold and eaten in the U.S. originates from California's Salinas Valley?